Although seasonal drought is experienced in all of the world's sub-tropical areas, in recent years the greatest effects have been felt in sub-Saharan Africa, including the region known as the Sahel where drought is much more persistent than elsewhere on the continent (Nicholson 1989). The Sahel proper is that part of western Africa lying to the south of the Sahara Desert and north of the tropical rainforest. It comprises six nations, stretching from Senegal, Mauretania and Mali in the west, through Burkina Faso to Niger and Chad in the east. This region, with its population of 33 million inhabiting slightly more than 5 million sq km of arid or semi-arid land, came to prominence between 1968 and 1973 when it was visited by major drought, starvation and disease. Despite this prominence, it is, in fact, only part of a more extensive belt of drought-prone land in Africa south of the Sahara. Drought pays no heed to political boundaries, reaching as it does to the Sudan, Ethiopia and Somalia in the east and including the northern sections of Ghana, Nigeria, Cameroon, the Central African Republic, Uganda and Kenya. 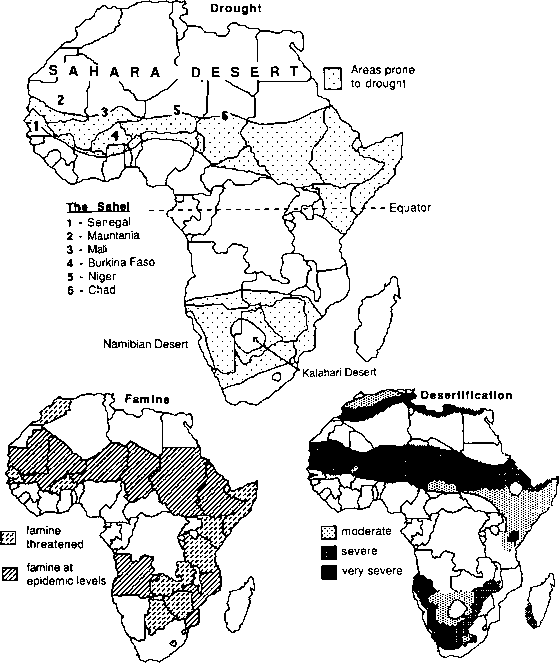 In the 1980s, drought also extended into Mozambique, Zimbabwe and other parts of eastern and southern Africa (see Figure 3.5). governed by seasonal fluctuations in the position of the ITCZ. Dry conditions are associated with hot, continental tropical (cT) air, from the Sahara in the west and the Arabian Peninsula in the east, which moves in behind the ITCZ as it migrates southwards during the northern hemisphere's winter. 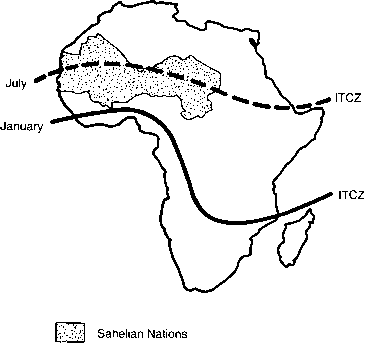 At its most southerly extent, in January or February, the ITCZ remains at about 8 degrees north of the equator in West Africa, but curves sharply southwards across the centre of the continent to reach 15-20°S in East Africa (see Figure 3.6). Apart from East Africa, which receives some precipitation brought in off the Indian Ocean by the north-east trade winds of the winter monsoon, most of the northern part of the continent experiences its dry season at that time. All of West Africa, beyond a narrow strip some 200 km wide along the coast, is under the influence of a north-easterly airflow, from the central Sahara. This is known locally as the Harmattan—a hot, dry wind, which carries with it large volumes of fine dust from the desert. On occasion, the dust is so thick that visibility is reduced to less than 1000 m, and, in combination with the break-up of radio transmissions caused by the high concentration of aerosols, this disrupts local air traffic. The scattering of solar radiation by the Harmattan haze also has broader implications for such activities as agriculture, solar energy engineering and environmental planning (Adetunji et al. 1979). At the personal level, the low humidity of the dusty air contributes to discomfort in the form of dry skin, sore throats and cracked lips. in general terms, in detail the precipitation patterns are quite complex. In West Africa, for example, the existence of four weather zones, aligned east-west in parallel with the ITCZ, was recognized by Hamilton and Archbold in 1945, and these, with some modern modifications (e.g. 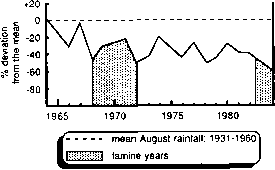 Musk 1983), provide the standard approach to the regional climatology of the area (see Figure 3.7). Each of the zones is characterized by specific weather conditions, which can be identified in the precipitation regimes of the various stations in the area (see Figure 3.8). The precipitation is caused mainly by convection and convergence, and reaches the ground in a variety of forms, ranging from light, intermittent showers, to the heavy downpours associated with violent thunderstorms or line squalls. The easterly tropical jet is also active in the upper atmosphere at this time, and may well influence the amount, intensity and distribution of precipitation (Kamara 1986). Throughout the Sahelian region, the peak of the rainy season in July and August is also the time of year when grass and other forage is most widely available for the herds of cattle, camels, goats and sheep belonging to the local agriculturalists. The original herdsmen lived a nomadic existence, following the rains north in the summer and south in the winter, to obtain the food their animals needed. There was sufficient moisture available in the southern areas to allow a more permanent lifestyle, supported by basic arable agriculture, producing sorghum and millet. Drawn south by the rains, the herdsmen eventually encroached upon this farmed land, but instead of the conflict that might have been expected in such a situation, the two societies enjoyed a basic symbiotic relationship. The nomads exchanged meat and milk for grain; the cattle grazed the stubble, and provided fertilizer for the following year's crop. disease and death. In contrast, good years are those in which the ITCZ, with its accompanying rain, moves farther north than normal, or remains at its poleward limits for a few extra days or even weeks. In the past, this variability was very much part of the way of life of the drought-prone areas in sub-Saharan Africa. 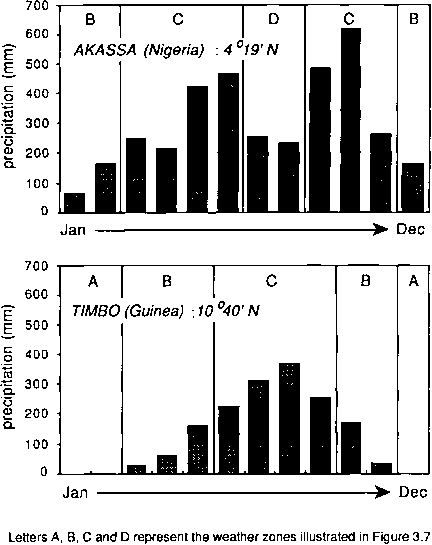 The drought of 1968 to 1973 in the Sahel was the third major dry spell to hit the area this century, and although the years following 1973 were wetter, by 1980 drier conditions had returned (see Figure 3.9). By 1985 parts of the region were again experiencing fully fledged drought (Cross 1985a). A return to average rainfall in 1988 provided some respite, but it was short-lived, and in 1990 conditions again equalled those during the devastating droughts of 1972 and 1973 (Pearce 1991b). Much as the population must have suffered in the past, there was little they could do about it, and few on the outside showed much concern. Like all primitive nomadic populations, the inhabitants of the Sahel increased in good years and decreased in bad, as a result of the checks and balances built into the environment. That situation has changed somewhat in recent years. The introduction of new scientific medicine, limited though it may have been by Western standards, brought with it previously unknown medical services—such as vaccination programmes—and led to improvements in child nutrition and sanitation. Together these helped to lower the death rate, and, with the birth rate remaining high, populations grew rapidly, doubling between 1950 and 1980 (Crawford 1985). The population of the Sahel grew at a rate of 1 per cent per annum during the 1920s, but by the time of the drought in the late 1960s the rate was as high as 3 per cent (Ware 1977). Similar values have been calculated for the eastern part of the dry belt in Somalia (Swift 1977) and Ethiopia (Mackenzie 1987b). Initially, even such a high rate of growth produced no serious problems, since in the late 1950s and early 1960s a period of heavier more reliable rainfall produced more fodder, and allowed more animals to be kept. Crop yields increased also in the arable areas. Other changes, with potentially serious consequences, were taking place at the same time, however. In the southern areas of the Sahel, basic subsistence farming was increasingly replaced by the cash-cropping of such commodities as peanuts and cotton. The way of life of the nomads had already been changed by the establishment of political boundaries in the nineteenth century, and the introduction of cash-cropping further restricted their ability to move as the seasons dictated. Commercialization had been introduced into the nomadic community also, and in some areas market influences encouraged the maintenance of herds larger than the carrying capacity of the land. This was made possible, to some extent by the drilling or digging of new wells, but as Ware (1977) has pointed out, the provision of additional water without a parallel provision of additional pasture only served to aggravate ecological problems. All of these changes were seen as improvements when they were introduced, and from a socio-economic point of view they undoubtedly were. Ecologically, however, they were suspect, and, in combination with the dry years of the 1960s, 1970s and 1980s, they contributed to disaster. The grass and other forage dried out during the drought, reducing the fodder available for the animals. The larger herds—which had grown up during the years of plenty—quickly stripped the available vegetation, and exposed the land to soil erosion. The water holes, and eventually even the rivers, dried up, and those animals that had not died of starvation died of thirst. 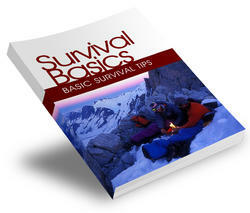 When the nomads tried to move they found that it was no longer as easy as it had once been. The farmers who had formerly welcomed the pastoralists for the meat and milk they supplied and for the natural fertilizer from their animals, no longer wanted herds trampling fields which, with the aid of irrigation, were being cropped all year round. Furthermore, growing peanuts and cotton, and only a little food for their own use, they had no excess left for the starving nomads. Eventually, as the drought continued, the farmers suffered also. There was insufficient water for the irrigation systems, the artificial fertilizers that had replaced the animal product was less effective at low moisture levels, and yields were reduced dramatically. In a desperate attempt to maintain their livelihood, they seeded poorer land, which was soon destroyed by soil erosion in much the same way as the overgrazed soil of the north had been. The net result of such developments was the death of millions of animals—probably 5 million cattle alone—and several hundred thousand people. The latter numbers would have been higher, but for the outside aid which provided for 7 million people at the peak of the drought in the Sahel between 1968 and 1973 (Glantz 1977). Similar numbers were involved in Ethiopia between 1983 and 1985, although accurate figures are difficult to obtain because of civil war in the area (Cross 1985b). 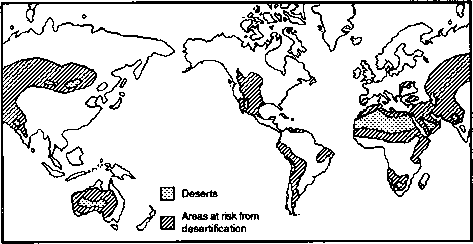 Drought and locusts destroyed crops in the northern Ethiopian provinces of Tigray and Eritrea again in 1987, and the UN World Food Program estimated that as many as 3 million inhabitants were put at risk of starvation and death (Mackenzie 1987a). Elsewhere—in Kenya, Uganda, Sudan, Zimbabwe and Mozambique—severe drought continued into the 1990s. Even in the Sahel, which had experienced some improvement in the late 1970s, increasing aridity after 1980 was the precursor of the more intense drought affecting the area once again. The death of the animals, the destruction of the soil and indeed the destruction of society has meant that all of sub-Saharan Africa—from Senegal to Somalia— remains an impoverished region, dependent upon outside aid and overshadowed by the ever present potential for disaster the next time the rains fail, as fail they will. What are problems of itcz in the southern africa? How is drought a environmental issue in south africa?